In large bowl, mix melted butter, mustard, salt and pepper. Add potatoes and ham; stir until evenly coated. Divide mixture among sheets of foil. Place packs on grill over medium heat. Cover grill; cook 12 minutes. Rotate packs 1/2 turn; cook 8 to 10 minutes longer or until potatoes are tender. Remove packs from grill; cut large X across top of each pack. 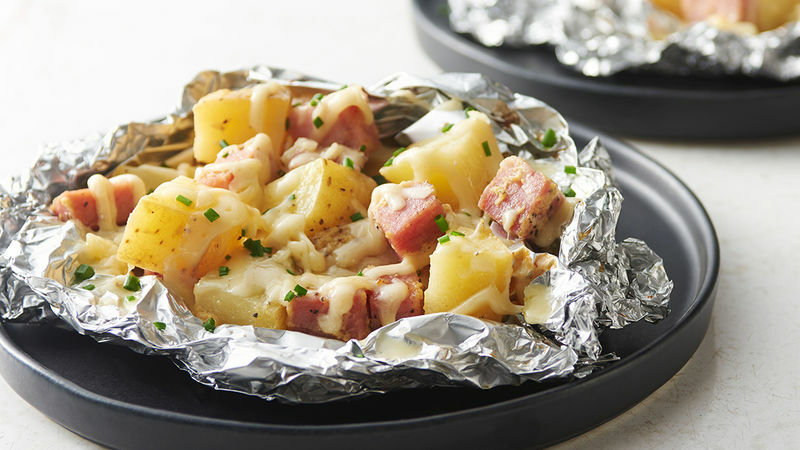 Carefully fold back foil; sprinkle potatoes with cheese. Loosely close; let stand 3 to 5 minutes or until cheese is melted. Garnish with chives. To make in oven, place packs on cookie sheet. Bake at 375°F 40 to 45 minutes or until potatoes are tender. Add cheese and chive garnish as directed above. For extra flavor, try using an aged Gouda cheese in this recipe. Two-bite Yukon potatoes can be substituted for regular Yukon potatoes in this recipe. Cut each potato in half, and prepare as directed in recipe.